By Brian Voo in Internet. Updated on November 18, 2017 . Ever need help with a complex software but your trusty co-worker is halfway around the world, unable to assist you? Something like remote assistance could do but with a program like Screenhero, you’ll get features that are non-existent in remote assistance programs. 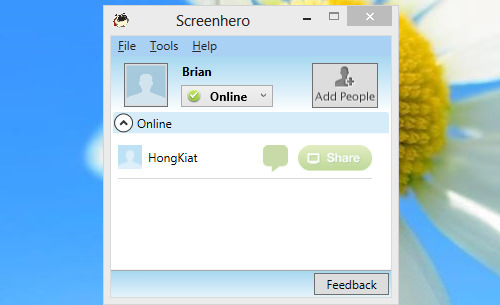 When sharing your screen with someone else, Screenhero gives each of you your own mouse cursor, giving both of you the ability to control any software installed on the host’s computer. The program is absolutely free and is no hassle to use as sharing can be done in a click of a button. Both users have to sign up for an account and use a messenger-like program. It works like the Share Screen function on Mac OS but it’s better in the sense that it works cross-platform. 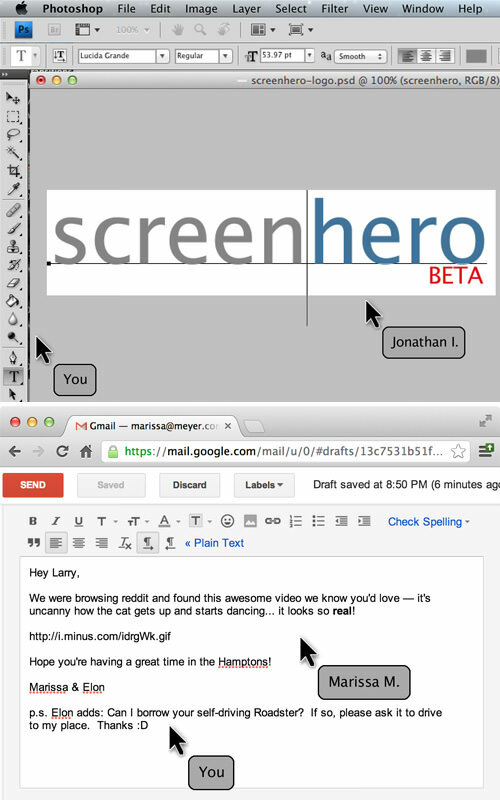 Here’s how to use Screenhero. First, head over to the Screenhero website to download the program. There is a Windows (7 & 8) and Mac (10.6.8 and up) version which covers majority of users out there. After you have installed the program, run it and you’ll see this login screen. 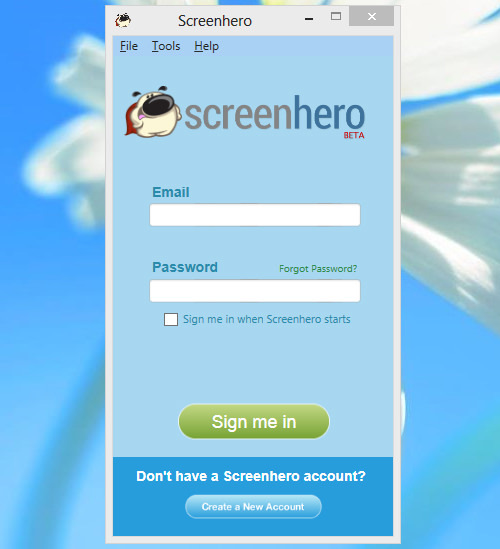 Click on Create a New Account at the bottom, fill in your details and you can begin using Screenhero. Screenhero looks very simple. You add other users simply by entering their email and they will appear on your contact list. With a contact is added to your list, you can chat with them by pressing the green chat box next to their name. 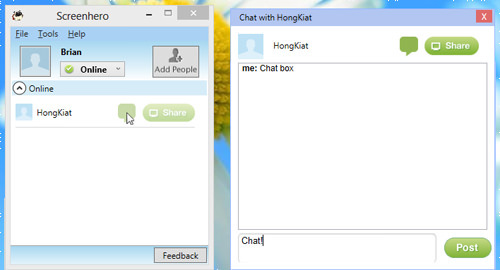 A chatbox will pop out and you can begin chatting with them. 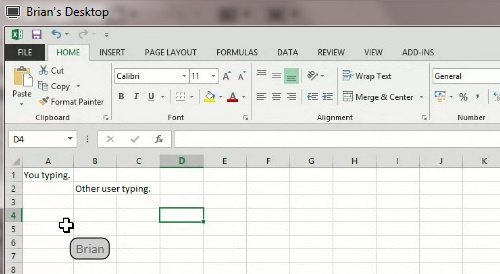 To share a program window or entire screen with the other user, click on the Share button will allow. When you request to share your screen, the other person will receive a notification which they can accept or ignore. The person who accepts gains control to whatever program is being shared, and each user gets their own mouse cursor labeled with their names. Here’s how it looks like from my side. 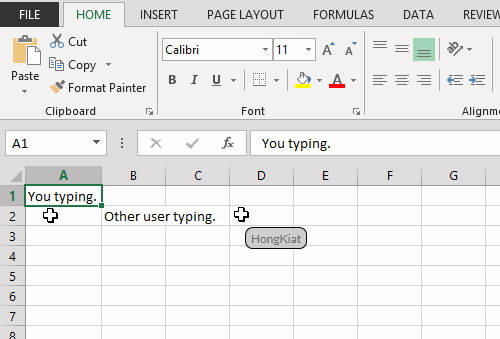 You can see my cursor, and hongkiat controlling the other cursor. We can both edit the Excel spreadsheet simultaneously. On hongkiat’s side, he gets pretty much the same view as what I see, but in a window form, labeled ‘Brian’s Desktop’. Any program can be shared and controlled with the 2 mouse cursors. This program is probably great for troubleshooting or for showing someone how to use a program, putting both users literally on the same page.